Have a kid, or buy a house in Philly? That's not likely to be the way a college-educated woman phrases the question to herself when she's considering starting a family, but it may best define the financial stakes of childbearing for her, according to a report released last week. Highly skilled women will lose as much as a third of their lifetime earnings by choosing to have a child, making the prospect of raising a family a far more expensive one for college graduates than their counterparts with less education, according to a report by the Cambridge, Mass.-based National Bureau of Economic Research. Educated women who have their first child at 30 lose $230,000 in lifetime earnings -- about equal to the average price of a house in Philadelphia -- according to the report. That number jumps to more than $300,000 for women who have their first child at age 25, and almost $360,000 for women who bear their first child at age 20. The lifetime cost of childbearing for educated women dwarfs that of women in lower skill groups, the report says. Women in the middle skill strata lose about $150,000 in lifetime earnings, while women in the lower skill strata lose about $60,000. "Wages of women rise sharply and largely in unison in the period prior to their having children, but at almost precisely the moment they bear children, their wage profiles flatten out," the report says. "Childbearing has a large impact on wages, and that the impact of childbearing is greatest for women that have the strongest skills." The effect of child-rearing on professional women has gained relevance as more mothers return to work after giving birth. About 72% of mothers with children under 18 years old were in the U.S. labor force in 2009, down slightly from 73% in 2000 but markedly up from 47% in 1975, according to a December 2010 report by the Bureau of Labor Statistics. The NBER report also casts a more detailed light on factors that may cause women to continue to lag men when it comes to wages. The average pay of a full-time working woman rose from 62% of her male counterparts in 1979 to 81% in 2005, and for good reason -- the percentage of working women between the ages of 25 and 64 with college degrees has more than tripled to 36% in 2009 from 11% in 1970, according to the BLS. Still, the average woman's wage as a percentage of the average man's has fallen slightly since its 2005-06 peak to 80% in 2009. 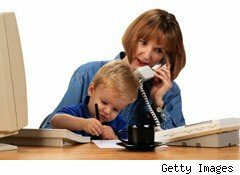 As for highly-skilled women, the workplace perception that a mother may be less likely to give up her off time to get the job done and may be more susceptible to being pulled away by family obligations likely remains a factor in both wages and promotions, according to Eileen Boris, Hull professor and chairwoman of UC-Santa Barbara's feminist studies department. "I'm not surprised," Boris said of the wage penalty cited by the NBER report. "We value 24/7 participation in highly-skilled professional jobs." While statistics implying that women give up substantial lifetime earnings to have a child aren't new, the NBER report differs from some previous studies by insisting that wage discrimination still exists and by putting a dollar figure on it. A 2007 report from UC-Berkeley and the University of Oslo said that the U.S. government and employers were following the lead of Scandinavian countries by instituting more family-friendly policies such as paid parental leave, tax benefits to families, publicly supported childcare, and ensuring that there would be little or no wage penalty for part-time work. In addition to workplace institution of such policies, society appeared to be doing a better job of helping out the working mother as it became more commonplace for fathers to participate in childcare and do more work around the house. In 1965, married mothers spend about eight times as much time on weekly household work as married fathers. By 2000, mothers were doing twice the household work. As a result, the wage penalty for mothers likely shrank during recent decades so that, on average, mothers in the mid 1990s made about 4% less than non-mothers, compared to a differential of about 8% during the early 1980s. Additionally, the differential when factoring out occupation and workplace was minimal. "The motherhood penalty does not arise from employers paying mothers less than non-mothers. At that level there appears to be neither discrimination nor productivity differences by motherhood status," the Berkeley/Oslo report said. "The penalties may arise however from differentials in hiring, wage increases, or promotions." Those factors may have the largest impact when applied to the lifetime motherhood costs of a highly skilled woman, as the perception that a mother is less willing to put in the extra time on the job may hinder her ability to move through the ranks, according to the NBER report. As a result, when one factors out women who had to switch jobs, switch companies, take extensive time off for child birth or returned to work in a part-time capacity, more than half of the impact on wages remains. "Even if women work full-time at their same employer, on average, their wage growth slows and over time their pay appears to be 14% lower," according to the NBER. Such a discrepancy is likely to continue. The factors that may account for the largest part of the wage penalty -- different standards for hiring, salary bumps and promotions -- are the most challenging to address because they're the hardest to prove and limit through legislation. And while the Clinton and Obama administrations each made some strides in this area, the economic downturn has made companies less willing to take creative approaches to family-related employee benefits, according to UC-Santa Barbara's Boris. "There are a lot of employers who want to do the right thing, but it's a buyers' market" when it comes to the company-worker dynamic, said Boris. "There's always been the fear that, if there are family benefits, the people who need to use them will get demoted or not get hired."